Shawn Huff created this pressurized, portable tap system to combat common growler problems. Folks in Portland, Oregon have some strong convictions when it comes to beer: They believe that draft is its natural state, and that nothing's quite as sad as a growler half full of flat, warm brew. 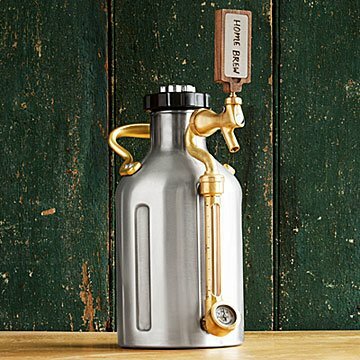 Fellow beer lovers rejoice—Portland designer Shawn Huff created this pressurized, portable tap system to combat these common growler problems. His design is packed with features that keep your favorite brew in optimal conditions down to the last drop. Unlike glass growlers, this one will survive bicycle mishaps, so you can throw it in a basket for draft beer-to-go (how Portland is that?). It's a great way to enjoy craft beer or homebrew with friends—straight from your refrigerator or, well, anywhere. Designed in Portland, Oregon. Made in China. Double-walled, stainless steel growler, vacuum-insulated to keep your beer cool for up to nine hours. Adjustable pressurization cap to keep oxygen out and carbonation at an ideal level using small CO2 cartridges (two included). Steampunk-inspired tap assembly with pressure and level gauges to keep an eye on your beloved beer. Gooseneck tap that swings sideways for compact transportation. Tap handle that can be swapped for one from your favorite brewery. Illustrated manual including ideal pressure settings for different varieties of beer, instructions for force carbonating homebrew, and two tempting cocktail recipes. Add the Oregon black walnut handle with magnetic stainless steel plaque for more taproom style. It lets you note the name of your beer with any dry-erase pen. When Shawn Huff was trying to impress a girlfriend's parents with some of Oregon's finest IPA, he ended up pouring the stuff down the drain two days later (hopefully not a relationship omen). The beer had gone flat and stale in a glass growler. That's when he decided to consult Brian Sonnichsen and Evan Rege, two close friends, avid home brewers and engineers. The beer lovers needed a solution to keep craft beer fresh. Shawn's been an entrepreneur since childhood, making and selling pottery and walking sticks during summers in Ashland, Oregon. With an MS in Chemical Engineering, the Portland native brings a science background along on his mission to banish flat beer. He boasts a "best innovation" award from the University of Washington's business plan competition. Fun and useful gift for the craft brew lover in your life. Recipients plan to use for their own home brews. We have a ton of breweries in our city. Now we can actually keep the beer without it going bad. Plus it's a statement piece when friends come over. Used to transport home brew to Mountain Cabin, Transport home brew to parties. Use it with guesrs at home bar. Show everyonehow beautiful it is . I gave this to my husband for Father's Day. He loves the way it looks and is excited to try it. But I paid the extra $25 for the rectangle wooden tap handle, but received a small square one that isn't big enough to write on. Sadly disappointed. If you could please ship the tap handle that is pictured, it would be greatly appreciated. Otherwise, your photo and product description should be updated so customers actually receive the product that is advertised. This is the perfect addition to my boyfriend's at home bar! I've been buying him liquor dispensers for years for Uncommon Goods and this was the perfect fit to add beer to the collection. It's a statement piece, the topic of conversation, and will be around for many more at home parties. My sister and her boyfriend moved to Boston this year and have now become beer lovers! They love trying new IPA's, microbrews, etc. The part they love most about Boston is all of the breweries at their disposal so what better gift than this! They got it early and are already bringing home growlers to use with it! They love it and I love that they love it, a true home run! I have one and two of my friends have one. Yes, it's pretty, but it's very poorly made. The CO2 leaks, and seals blow out on it constantly. I love the concept, but it has turned into the most expensive decoration in my apartment. This item comes with CO2 cartridges, which are prohibited from shipping by air. Only Economy or Standard shipping is available for this item, and we cannot ship to Alaska or Hawaii (yeah, we're bummed, too).